Manila is located on the Luzon island and goes along the shore of Manila Bay. The city is divided by the Pasig River. Manila is made up of 17 districts and 4 administrative divisions. Business centers and spread across the city, however, the main chief centers of trade and commerce are located to the north of the river. 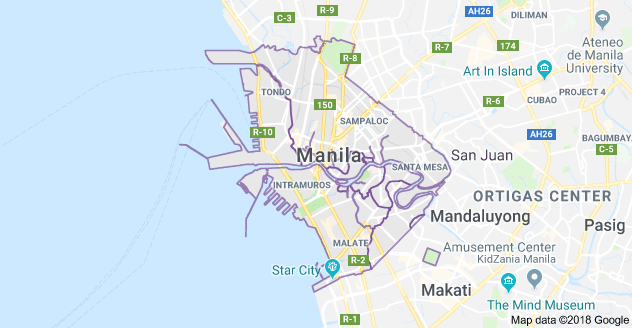 The Northeast corner of Manila, Sampaloc, became home to universities and education centers, San Miguel district is the site of the city where Malacañang Palace, the presidential residence, is located. The southern point of the city is the Manila North Harbour, the main international port. Here, at the south shore district, Ermita and Malate, all hotels and embassies are located, it is also regarded as the middle- income residential area. Metropolitan Manila is one of the three metropolitan areas of Philippines, together with Metropolitan Cebu and Metropolitan Davao. It is also known as the National Capital Region (NCR), or simply Metro Manila. Unlike other administrative regions of the country, the area is not composed of provinces. Instead, the area is divided into four ‘districts’: Manila, Caloocan City, Quezon City, Pasay City and other 13 municipalities.